This is our first gynae visit together with my Mom. Yes, my Mom is now in Cape Town, for the next 3 months!! Our appointment was scheduled at 3:30pm and usually there would a bit of waiting before we got to our turn. Surprisingly, we were called in around 5 minutes upon us reaching the doctor's office. To be fair, I had my lunch around more than 3 hours before the appointment, so I guess all the sugar was gone by then. 67 kg (gained only 700 grams from last visit 2 weeks ago). Really, I am gaining much less in my third trimester compared to my second. Must be a combination of less amniotic fluid and baby getting all the nutrients. He is now 3.7kg - an increase of 0.4kg from two weeks ago. Still in the same position as last visit, although his head is tilted down in the right position. He is not facing my spine yet, still sideways. Just waiting for baby to drop and engage. Placenta decalcifying as should be at Week 38+. Amniotic fluid is now much less than previously. Doctor measured it to be 6cm. (5cm is considered low). I am a bit worried about this, although I am not sure if I need to be. Doctor said she will see me again next week. 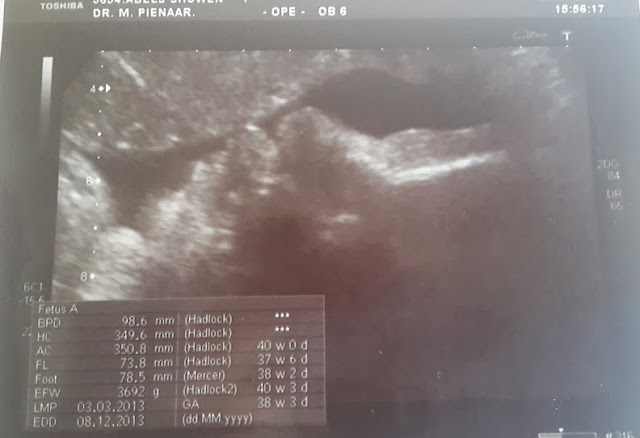 Doctor also mentioned she sees the possibility of baby arriving in a week or so!